I love helping Find-a-Grave. So, when I saw a request for a marker at the nearby Dunstan Cemetery I was happy to try to photograph the marker. It was even more exciting because my wife’s favorite beach and the road we live along (Pine Point) were named after that individual, Charles Pine. 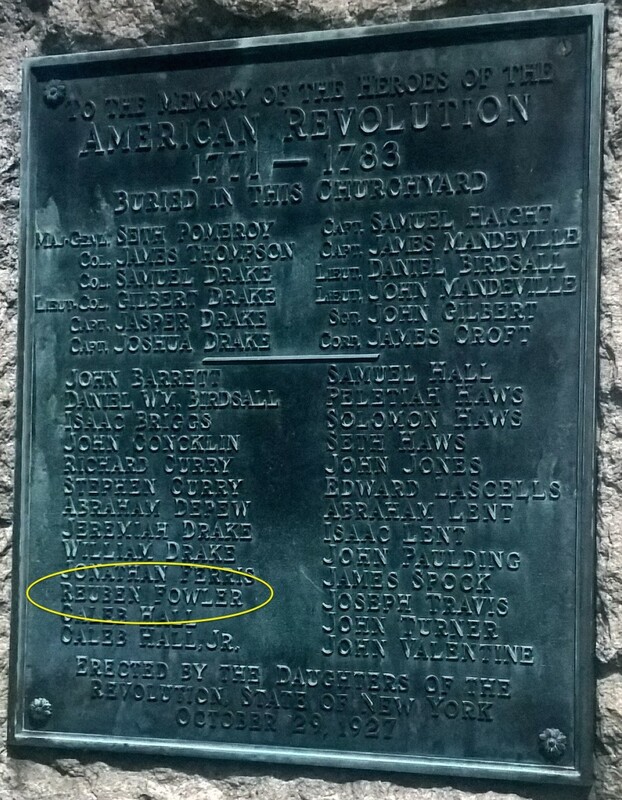 Charles Pine came to Scarborough about 1702 and died in Scarborough in 1753, so he was definitely one of the early settlers of Scarborough, Maine. 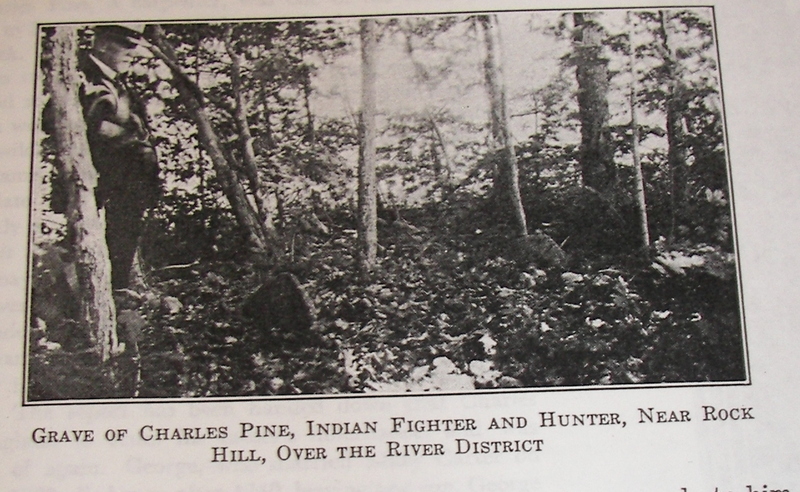 The entry for Charles “The Indian Fighter” Pine on Find-a-Grave was substantial[i]. Not only were his birth and death dates provided but also his children’s names and it indicated that he was buried at Dunstan Cemetery. Dunstan Cemetery is a modest size but still has over 1300 internments so it would be easy to miss a marker. Also, I was afraid that a 260-year-old burial might not still be marked. So, I thought I’d see what the Scarborough Museum (and Scarborough Historical Society) has that might help me. I recently began volunteering there and figured that finding Charles Pine’s marker would be a good little project to help me start learning about the resources at the museum. I asked one of the other volunteers if they had anything showing the plots and markers for Dunstan Cemetery. She showed me a bookcase and said to look there. 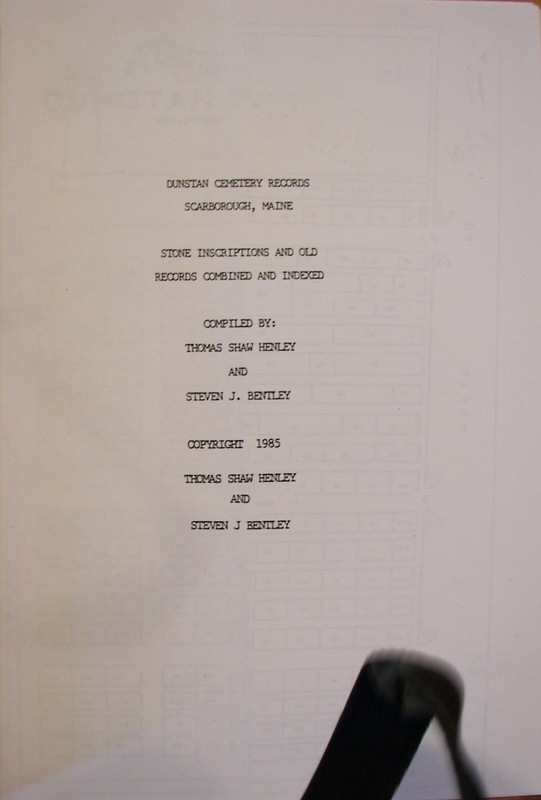 Sure enough, there was the perfect book, Dunstan Cemetery Records, Scarborough, ME ©1985 by Thomas Shaw Henley & Steven J. Bentley[ii]. What a fantastic book – and it is indexed. A quick look at the indexes and I immediately saw that Charles Pine was not listed. I did see the note that said, “There are many lots without stones at the cemetery and without records at town hall.” I thought, that’s that; no marker remains. Then I had another idea. I had seen a large two-volume notebook, titled, “Cemeteries of Scarborough” ©1997 by Janice Makowski at the museum. I thought, “Maybe there is something in there,” so I gave it a quick look. There was Charles Pine, same death date as on Find-a-Grave; however, it said he was in Cemetery #56, “Pine Cemetery.” Apparently, Charles Pine, for whom Pine Point was named for, is buried near Broadturn Road, on the left, just before you cross the Nonesuch River. Ms. Makowski’s notes were extremely detailed as to exactly where the burial ground is located. Apparently, Charles is the only person interred there and two marker rocks, which contain no inscriptions, identify his burial plot. She also had copies of pages from the 1925 book, Grandfather Tales of Scarborough that included a photo of the stones[iii]. So, now I know Charles Pine isn’t buried at Dunstan Cemetery. The next time I drive up Broadturn Road on a nice dry day, I’ll try to stop and try to get a modern picture of the two Charles Pine grave marker rocks. Hopefully, they are still there and I can find them. My volunteer time at the Scarborough Museum provided me access to resources that saved me time on my Find-a-Grave volunteering. I also learned a lot about Charles Pine, a definite “Ancestor of Place.” That’s a win-win. [ii] Henley, T. S., & Bentley, S. J. (1985). Dunstan cemetery records Scarborough, Maine: Stone inscriptions and old records combined and indexed. Maine: T.S. Henley and S.J. Bentley. [iii] Moulton, Augustus Freedom; Grandfather Tales of Scarborough, Katahdin publishing company, 1925. I love Find-a-Grave. It is a fantastic resource for genealogy research; and, I really like to do my part in helping the database along. As such, I like to volunteer to fulfill photo requests. It provides a great opportunity to get out into the fresh air, get some sun, and provide a purpose to visit a cemetery. The other thing is I often request photos on Find-a-Grave and think it is only right to take as many photos for others as I request. Since moving to Maine last year, I really hadn’t had an opportunity to get out for a cemetery walk. The snow was gone, the ground was fairly dry, the temperature was comfortable, no reason not to do my part. I had seen six requests for photos for Gorham Cemetery. (It is also known as South Street Cemetery according to Find-a-Grave and Old Village Cemetery by the local historical society). I saw it was fairly small, 130 interments, the size I could mindfully walk in an hour or so. It was also close enough, about 20 minutes away. Rather than just looking for the six photo requests that were active, I thought I’d apply the filter of “Names with no grave photos” and print out the list. Then I highlighted the six names that were active requests so I could provide special attention to them. I packed my camera, a mirror, and a whisk broom and headed out. As I walked I looked to see if the name was on my list of individuals whose markers should be photographed for Find-a-Grave. All together, I took 27 photos of 9 markers that weren’t in the Find-a-Grave entries for the cemetery. Back home posted 8 of the photos to Find-a-Grave (One of them will need some Photoshop work to make it usable.). I then reported that I walked the entire cemetery and was unable to find the markers to FG. 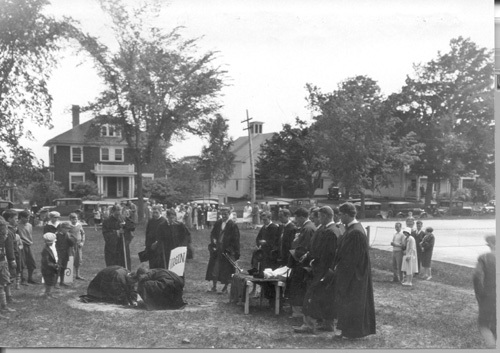 I wondered if the Gorham Historical Society had anything regarding the cemetery. Sure enough I found their website and on it was a downloadable spreadsheet of “Town of Gorham Cemetery Records.” None of the six individuals requested were on the listing, however, all eight of the markers I did find were there. My inference is that the six requests were based upon entries in Find-a-Grave that were there by mistake. 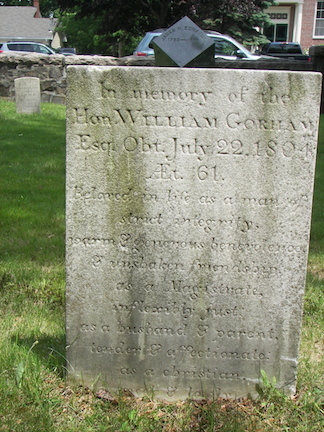 I then went back to Find-a-Grave and indicated for those requests that, “The Gorham Historical Society’s ‘Town of Gorham Cemetery Records’ has no listing for this individual. Please see: http://www.gorhamhistorical.com/vital-records.” I also suggested that their photo request be withdrawn. As I looked at those records I realized there was no source for the information other than the creator of the memorial. There is a place for general notes but nothing to identify what the entry creation was based upon. I feel that is a major shortcoming of Find-a-Grave. Maybe, now that it is owned/managed by Ancestry.Com, they will add a source field to the data. I think it is a necessary addition that will help volunteers understand the data they are looking at and suggest revisions or removal of incorrect data. A few notes regarding Find-a-Grave. Don’t use Find-a-Grave entries as a source. Consider them as clues. Consider Find-a-Grave entries with photos done by someone other than the creator as confirmed there is a grave with the stone shown. Remember, markers often have errors, too. Always check and check for a local historical society and see if they might have additional information on the cemetery. When you do find a problem with Find-a-Grave information, query back to the originator. Be nice, state the facts as you have them including your sources. former Project Manager (PMP), I am all about the process. I thought I’d share a bit of my process here. of information. 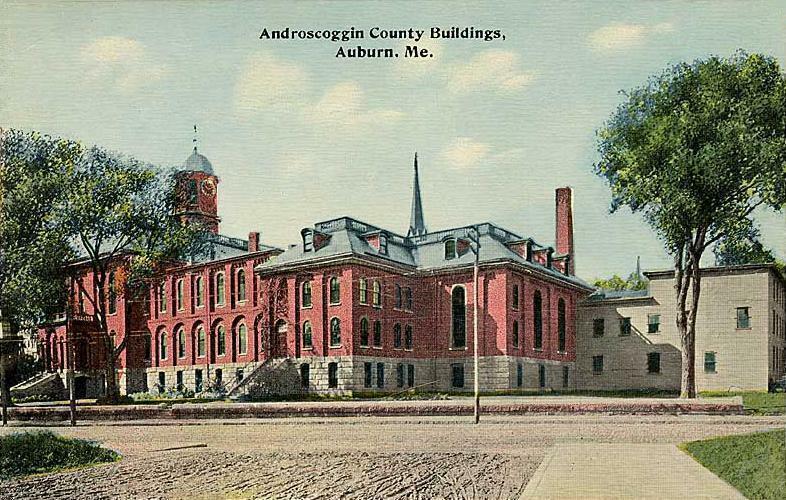 I knew her parents names and where they lived (Auburn, Androscoggin County, Maine). With that information, I started with my basic “getting to know you” process. two or three years from after World War II until into the 1950s. immediately that her father had been a World War II veteran. Good to know — I’ll look into that more late. of a brother that was born before my sister-in-law and died that same year as an infant. I’d use that source box records to save image files to my thumb drive. dive will most likely yield more information. wonder if he was bilingual. I know his wife spoke both English and French. on-line and the form was clearly in her mother’s hand. wondered if a yearbook might be available on line. Yup. substantial overlap). Actually, I found the information in an hour or two, documenting it took several times longer than finding the information. parents. But this is a good first beginning to get to know my sister-in-law’s people. That is kind of the start of my process. I think that it provides enough information to know a bit about a person. Enough to begin to ask more questions and focus my further research. specifics of individuals or couples who have been dead less than 25 years. Find a Grave & the Cobb County Cemetery Book. I regularly volunteer to fulfill requests with Find A Grave. I love them and what they are doing. They are a great resource for unofficial death records. They provide a great place to remember people who have past, and, most importantly, they are a source for photos of the markers of your ancestors. If there is not a photo there, you can request one and a volunteer, like me, will go to the cemetery, take a photo of the marker, and upload it to the website. Some time ago I volunteered to photograph a marker. I walked the entire cemetery and couldn’t find it. I put it back into the queue figuring someone else would find it. Another person tried and marked the memorial that he couldn’t find it either. Every time I went onto the Find A Grave site looking for markers that people want photos of there it was, staring at me. Then I had an idea…. The Smyrna Historical and Genelogical Society has a small research library filled with books of genealogical interest. Among the many books and magazines I found a book on Cobb County Cemeteries. Back in the 1980s, surveys were taken of the various cemeteries in Cobb County. This individual died in 1922 so she should have been listed. She was listed as being in plot 12. I also found that the other people in plot 12 were N.C. Meadows and Mattie Meadows. Also in the plot were Catherine Loveless and Lula West. It is not a huge cemetery, but it isn’t that small either. I wondered where plot 1 was so I could find plot 12 easily. I figured that with that information, I could find any of them and figure out the numbering scheme. I went up to the cemetery, drove slowly through the cemetery and didn’t see any of the names. I figured that meant that the numbering didn’t go horizontally across but rather from one corner away from the road. I parked the car near one of the corners and started to head to the corner. On the way I saw the Rakestraw marker and made a beeline to it. Yup. It looked about six plots away from the road. Three more markers up the hill was a Brown plot, I was getting close. There they were, N.C. Meadows, Mattie Meadows, and a small unreadable marker. Getting close to it I could just make out “AT REST”. It was knocked partially over (down to about 30 degrees). I gently reached behind it and could feel lettering. I carefully lifted the marker upright and could see it was the marker I was looking for. I photographed it and set the marker back to vertical. It still faces out of the cemetery. I figure that is what the family originally wanted. 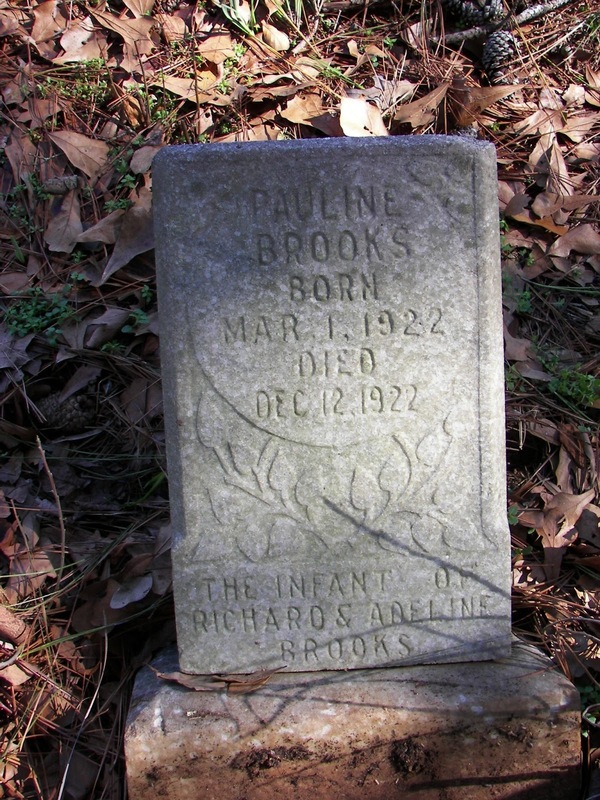 So, little infant Pauline remains “at rest” but a photo of her marker is now on Find A Grave. The Cobb County Cemeteries Book at the Smyrna Museum is one of many books that that can be of great assistance to your genealogical and volunteer activities. Stop by during normal hours of operations and someone can assist you in the reference room. Stop by on a Tuesday morning (when I volunteer) and I’ll give you a brief tour. Author Don TaylorPosted on January 19, 2013 September 10, 2016 Categories UncategorizedTags Cemetery, Cobb County Cemetery Book, died, Find A Grave, marker, New Smyrna Cemetery, photograph, SHAGS, SHGS, Smyrna Historical and Genealogical Society, Smyrna Museum, Wednesday's ChildLeave a comment on Find a Grave & the Cobb County Cemetery Book.